Every day, almost 1 billion people go hungry. 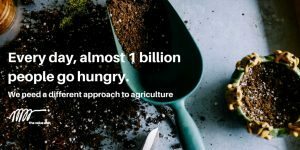 We will only face scarcer resources and increasing need; projections place the world’s population at over 9 billion people by 2050, with nearly twice the current demand for food. Agriculture, the foundation of our global food system, requires a new approach. Feeding the world today, and securing a healthy planet to sustain future generations, poses a deep structural challenge to humanity, a challenge we all have the moral and social responsibility to address. In 2005, a group of 60 leaders met at the World Economic Forum’s Annual Meeting in Davos and worked together to create what has become the New Vision for Agriculture. This long-term initiative is comprised of 450 organizations and a close-knit network of 1,000 leaders united in their mission to address the major challenges of global food security and agricultural sustainability. The Value Web has been involved with this initiative since the beginning, assisting the Forum with co-design and facilitation of every large-scale gathering over the past 10 years, and helping to build the momentum for significant, concrete impact on the ground. In 2015, The Value Web supported another annual gathering of the Transformation Leaders Network, to facilitate connection, collaboration, and collective insight toward systemic solutions. The Transformation Leaders Network workshop conducted on October 6-8 in Amsterdam was comprised of local leaders from 18 partner countries that have each launched multi-stakeholder partnerships in their respective nations, aiming to achieve the New Vision for Agriculture. They included representatives from academia, business, civil society, international organizations, donor agencies, and nonprofit foundations. During the 2.5-day workshop, network members furthered their collective commitment to achieve sustainable, inclusive agriculture development, and food and nutrition security. They learned from each other’s experiences in the field, offered and received support in a collaboration marketplace, and strengthened partnership models. The experience reinforced the strong community spirit of the network, which created even greater connectivity and shared intent through authentic dialogue and collaboration. Thanks to the extraordinary support of the Dutch Government in combination with the Forum, this gathering connected the global leadership conversations that take place in Davos with concrete local action by strengthening and supporting a strong network of “doers.” The Value Web is grateful for the invitation to act as a partner with the World Economic Forum and the Dutch Government in this global initiative that aligns with and embodies our hope for the large-scale betterment of lives around the world. This 10-year collaborative effort has been developed into a Harvard University case study. (Tackling Global Challenges: Lessons in System Leadership from the World Economic Forum’s New Vision for Agriculture Initiative).